The Double Tree by Hilton Kamloops is reaching out to their fellow community members for support in assisting our neighbours in Fort McMurray, Alberta. 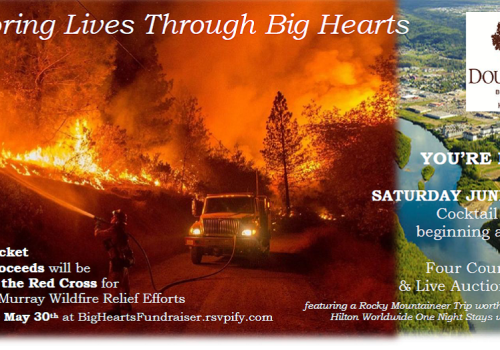 Saturday, June 4, 2016 save the date for the Restoring Lives Through Big Hearts Fundraiser. An event donating 100% of proceeds to the Fort McMurray Wildfire Relief Efforts! A cocktail reception will kick off the evening at 5:00pm, followed by a delectable four course dinner and live auction. Partake in a great deed while simultaneously enjoying an evening of good company, great music, delicious cuisine, and mesmerizing wine sponsored by our neighbors, Monte Creek Winery. We ask that you don&apos;t forget to partake in our live auction featuring a number of fantastic prizes including a gold level trip for two donated by our very own Rocky Mountaineer. Trip value over $4,500. Prefer to head south for the winter? Then be sure to raise your bidding paddles for a one night stay in any Hilton hotel worldwide, valued at over $7,600! We are really thrilled to welcome many more great sponsors to our live auction including: WestJet, Paddle Surfit, River City Cycle, Harley Davidson, The Blazers, The Dunes Golf Kamloops, and many more. It&apos;s shaping up to be a great night thanks to our community and our neighbours! Our community has already done so much for our Fort McMurray neighbours but let&apos;s not stop now. Please join us in showcasing what big hearts we have here in Kamloops!